“Are we going back home?” Vivan asked. Karl glanced at her, then looked around. He realized that he was heading back toward Palo Verde. He had left home heading nowhere in particular except away from Mary and Doro. Now he had made a large U and was heading back to them. And it wasn’t just an ordinary impulse driving him. It was Mary’s pattern. He pulled over to the curb, stopped under a NO PARKING sign. He leaned back in the seat, his eyes closed. “Will you tell me what’s the matter with you?” Vivan asked. She was doing all she could to keep calm. It was his silence that frightened her. His silence and his obvious anger. He wondered why he had brought her with him. Then he remembered.”You’re not leaving me,” he said. He turned to glare at her in disgust. “Karl, for heaven’s sake! Tell me what’s wrong!” Now she was crying. “Be quiet.” Had he ever loved her, really? Had she ever been more than a pet-like all the rest of his women? “How was Doro last night?” he asked. She looked startled. By mutual agreement, they did not discuss her nights with Doro. Or they hadn’t until now. “Doro?” she said. “That’s enough!” Outrage was fast replacing her fear. A pet, he thought. What difference did it make what you said or did to a pet? A pet. In pets, free will was tolerated only as long as the pet owner found it amusing. Karl hit her. He had never done such a thing before, but it was easy. She screamed, then foolishly tried to get out of the car. He caught her arm, pulled her back, hit her again, and again. He was panting when he stopped. She was bloody and only half conscious, crumpled down on the seat, crying. He hadn’t controlled her. He had wanted to use his hands. Just his hands. And he wasn’t satisfied. He could have hurt her more. He could have killed her. Yes, and then what? How many of his problems would her death erase? He would have to get rid of her body, and then still go back to his master, and now, by God, his mistress. Once he was there, at least Mary’s pattern would stop pulling at him, dragging at him, subverting his will as easily as he subverted Vivian’s. Nothing would be changed though, except that Vivian would be gone. Who was he thinking about? Vivian or himself? Now that Doro had tricked him into putting on a leash, it could be either, or both. 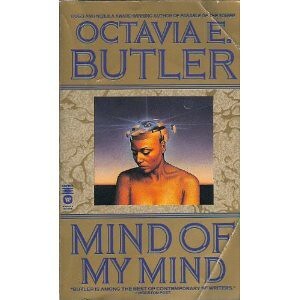 Mind of My Mind is the second book I ever read by Octavia Butler, and the one that stands out in my mind the most clearly. This is probably due to the heavy ethical questions explored within the text. The scene above looks at dynamics of abuse, contrasting the physical abuse Karl deals to Vivan with the mental abuse they both live under with Doro. In that small scene, Karl wrestles with the main questions of the book. Can you truly love someone you can control? Is the idea of benevolence a lie? After all, after Mary discovered her pattern, Karl accused her of fostering thoughts very close to Doro, who has been the series antagonist up to this point. This scene in particular is painful foreshadowing – both for Vee, who does eventually lose her free will, and all humans after the Patternists rise to power. The idea of free agency vs. a benevolent God is one heavily tapped in Mind of My Mind. Mary is put in a God like position, where her transition instantly gains her control of the formerly divided gifted. However, most of her first family initially resist her control, rightly fearing the amount of control she has over their lives. They soon realize death is their only true escape, so they eventually come around to the benefits of the arrangement. Still, Doro rightly feels usurped from his position as lead person in control, and battles Mary for control. When Doro casts the declaration of war, he notes “I can’t afford her unless she can obey me.” The theme of obedience in lessers returns time and time again, and often, it’s difficult to know what side to be on. The Patternists want freedom (of a sort) for themselves and to live under Mary; however, they easily deny this type of freedom to the humans (often referred to pejoratively as mutes) who live and work alongside of them. Still, relationships are complicated in Butler’s worlds. Doro and Mary approach their face-off, resigned to an ending, but not taking much pleasure in each other’s destruction until the heat of battle. After Doro is defeated, Emma (Anyanwu) chooses to die alongside him, despite their initial differences. And Mary’s ascension to Patternmaster alters the world. Readers, what stood out to you most in Mind of My Mind? What themes did you see? The post Mind of My Mind and Coercive Control [Octavia Butler Book Club] appeared first on Racialicious - the intersection of race and pop culture.